Praseodymium was discovered in 1841. It is strong paramagnetic in nature. It is widely used as an alloying agent with magnesium to make high strength metal. It is found in house equipment like color television, lamps and glasses. Praseodymium was discovered in 1841 by Carl Gustav Mosander through extraction from a rare earth oxide called ‘didymium’ which was obtained from the residues called ‘lanthana’. In 1869, didymium got the symbol ‘Di’ in Mendeleev’s first periodic table. In 1885 Baron Carl Auer von Welsbach separated ‘didymium’ into two different elements, one named praseodymium and other called neodymium. The word praseodymium has been derived from Greek prasinos meaning green, and didymos means twins as it produces green color compounds. Pure metallic form of praseodymium was first synthesized in 1931 . Praseodymium is not a rare element. It is present in about 9.1mg/kg of the Earth’s crust. 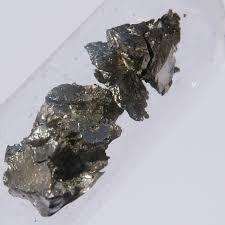 It is fourth most abundant element of the lanthanide’s series in the periodic table. It is present in phosphate, silicate and carbonate minerals like monazite (reddish brown phosphate mineral) and bastnaesite (family of three carbonate-fluoride mineral). Commercially, praseodymium is separated from lanthanides through ion exchange chromatography. Praseodymium is the third element of the lanthanide series. It is moderately soft and silver white metal. Its hardness is comparable with the silver and it is ductile in nature . It exist in two allotropic forms α and β. Praseodymium has a strong paramagnetic nature (materials are attracted by external magnetic field). It generally exist in trivalent state. Praseodymium chemical symbol is Pr. Its atomic number is 59. Atomic weight is 140.9. Melting point of Pr is about 931OC. The boiling point of Praseodymium is very high, i.e. 3520OC. Its density at room temperature is about 6.77 g/cm3. Praseodymium is tarnished in air slowly and forming oxide layer like iron rust. Its centimeter sized sample of metal corrodes in a year. At 150OC it forms praseodymium (III, IV) oxide, and it may be reduced to praseodymium (III) oxide in the presence of hydrogen gas. Praseodymium (IV) oxide is obtained by reaction with pure oxygen at 400OC and 282 bar. It is electropositive and react slowly with cold water and quite quickly react with hot water to form praseodymium (III) hydroxide. Praseodymium metal react with all halogens to form trihalides. It dissolves readily in dilute sulfuric acid and form solution which contain chartreuse (color between yellow and green) Pr3+ ions. Praseodymium dissolve in water and the solution contains yellow Pr4+ ions. Praseodymium is used in glass coloration (yellow and green color). It is widely used in making high-power magnets with great strength and durability. It is also used as an alloying agent in magnesium to make high strength metals which is used in aircraft engines. It is used to color ceramics yellow. Its salts are used to color glasses and enamels. Praseodymium is used in the core of high intensity carbon arc lights which are used in film industry and food lightning. It is also used for making specialized yellow glass goggles for glass blowers and welders. It is also main component of didymium glass, which protects welder’s eyes from intense light. Praseodymium is used as a doping agent in fiber optics as signal amplifier. It is used to make 5% misch metal (mixed metal containing cerium, lanthanum and neodymium) to make flint for lighters. It is also used as an alloying additions to ferrous and non- ferrous alloys. Praseodymium has low to moderate toxicity. Its soluble salts are mildly toxic in nature, but insoluble salts are non- toxic. In industrial working areas, it can cause lungs embolisms due to long term exposure. When it is accumulated in the body, it is dangerous for liver. Praseodymium has only one natural and stable isotope which is 141Pr. It has thirty two isotopes having mass number 121 to 154, all have half-lives under a day except 143Pr, which has a half-life of 13.6 days. Others isotopes have half-lives ranging from 10 millisecond to 13.57 days .
. Lide, D. R., ed. (2005). CRC Handbook of Chemistry and Physics (86th ed.). Boca Raton (FL): CRC Press. ISBN 0-8493-0486-5.